Midtown has the highest density of art and cultural institutions in the Southeast, notably including the Fox Theatre, Woodruff Arts Center, the High Museum of Art, the Center for Puppetry Arts, the Atlanta Symphony Orchestra, and the Museum of Design Atlanta. Midtown attracts over 6 million visitors annually, mostly in connection with large annual events such Atlanta Pride, the Atlanta Dogwood Festival, and Music Midtown. Since the 1990s, Midtown has also been a primary area for high-density development due to the area's mass transit options, urban street grid, and desirability. The definition and meaning of "Midtown" has varied over time, expanding from an original concept of a small neighborhood midway between Downtown and Buckhead. Boundary definitions vary by the source. In many cases, Midtown is a quasi-legal entity for zoning, law enforcement, and tax purposes. It is defined by the City of Atlanta to include the business district along Peachtree Street as well as Historic Midtown, the residential area east of Piedmont Avenue and to the south of Piedmont Park. The Midtown Alliance defines a larger, "Greater Midtown" area of approximately four square miles. This includes the area within the city's definition, but splitting it into the sub-areas Midtown Core and Midtown Garden District, i.e. Historic Midtown. It also includes the neighborhoods of Ansley Park, Sherwood Forest, Atlantic Station, Home Park, and Loring Heights. The area has gone by other names in the past. An 1897 source refers to the area as North Atlanta, which would later be the name of today's city of Brookhaven. The 1897 "North Atlanta" encompassed (roughly) most of today's Midtown, Georgia Tech, and English Avenue. 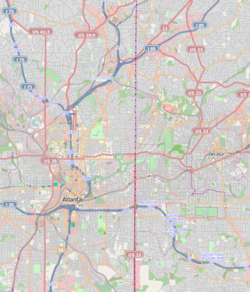 Sources from the 1950s and early 1960s refer to the area as "Uptown Atlanta," a moniker which would later be applied instead to Buckhead following its annexation. After the Civil War, Peachtree between what is now 8th and 12th streets was still about a mile beyond the city limits, which ended at Pine Street. After the American Civil War a shantytown named Tight Squeeze developed at Peachtree at what is now 10th Street. It was infamous for vagrancy, desperation, robberies of merchants transiting the settlement. As Atlanta grew ever further outwards from its historic center, mansions were constructed along Peachtree Street and the area around 10th was known as Blooming Hill. Cross streets were built and residential development began around 1880. Piedmont Park was established with the Piedmont Exposition of 1887, followed by the Cotton States and International Exposition of 1895, lending the area new prominence. Electric streetcar lines extended along Piedmont Avenue by 1895 and along Peachtree Street (to Brookwood) by 1900. In 1904, development on Ansley Park began. By the 1920s, Tenth and Peachtree had become the nexus of a significant shopping district for the surrounding neighborhood. The 1910 Encyclopædia Britannica listed Peachtree Street in Midtown as one of the finest residential areas of the city, along with Ponce de Leon Circle (now Ponce de Leon Avenue), Washington Street, and Inman Park. No part of the city has evolved more dramatically over the past two decades ... Impersonal office buildings, imposing parking decks and cold asphalt arteries have given way to high-rise living and an explosion of street life ... Where once there was a wasteland, now there are great restaurants, groceries, specialty shops, townhouses, lofts and ... people. In the area surrounding Peachtree Street, very little of the original architecture was preserved. Some of the notable exceptions listed on the National Register of Historic Places include the Margaret Mitchell House, Rhodes Hall, Edward C. Peters House, and the Academy of Medicine. Historic districts include the Fox Theatre Historic District and Historic Midtown; both are listed on the National Register of Historic Places. The Fox Theatre Historic District comprises the Fox Theatre (Oliver Vinour et al., 1929), William Lee Stoddart's Georgian Terrace Hotel (1911), Stoddart's Italianate Ponce de Leon Apartments (1913), and the Cox-Carlton Hotel (1925). Historic Midtown, which includes most of Midtown east of Piedmont Avenue, is noted for its bungalows and Queen Anne style houses. 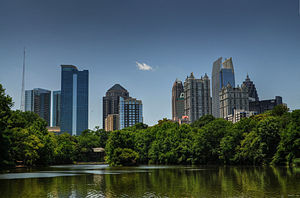 Midtown's focal point is the expansive greenspace of Piedmont Park, which underwent a major expansion in 2011. The park is surrounded by the Midtown business district to its west, Ansley Park to its northwest, the BeltLine, Morningside, and Virginia Highland to its east, and the Midtown Historic District to its south. The Atlanta Botanical Garden adjoins the Park. The BeltLine is a 22-mile-long (35 km) trail circling the older neighborhoods of central Atlanta which will be developed in stages. The BeltLine Eastside Trail connects Piedmont Park (at the intersection of 10th and Monroe) to the Inman Park MARTA station at DeKalb Avenue. The "Art on the BeltLine" project has resulted in the installation of several contemporary art pieces on the trail. Midtown Atlanta is a commercial district in its own right, containing 22,000,000 square feet (2,000,000 m2) of office space, with 8,200,000 square feet (760,000 m2) of office space added to the area since 1997, with up to 3,800,000 square feet (350,000 m2) more planned. Furthermore, Midtown is home to many corporate headquarters, such as Equifax, EarthLink, Invesco, and The Coca-Cola Company, as well as other corporations with a sizeable presence such as Norfolk Southern, Wells Fargo, PriceWaterhouseCoopers, and AT&T Inc. Carter's, Inc. had its headquarters in Midtown but moved to Buckhead in 2013. Regional offices for companies such as Google, Arcapita, and Jason's Deli are located in Midtown. Major law firms such as King & Spalding and Kilpatrick & Stockton are also located in Midtown. In April 2019, the largest Whole Foods Market in the southeastern United States opened in Midtown. Midtown is also home to a share of Atlanta's diplomatic missions. The Consulate-General of Canada is located in 100 Colony Square Building, as is the Netherlands Foreign Investment Agency. 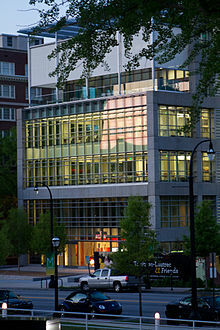 The Consulate-General of Switzerland in Atlanta is located in the Two Midtown Plaza building. The Taipei Economic and Cultural Office, representing the Republic of China, is located in the Atlantic Center Plaza. The Consulate-General of Israel to the Southeast is also located in Midtown. From 1995 to 2002, the Consulate-General of Japan in Atlanta was in Colony Square before moving to Buckhead. Midtown is known by many residents as Atlanta's "Heart of the Arts". It is the home of the Ferst Center for Arts, Fox Theatre, the Woodruff Arts Center, the Atlanta Botanical Garden, the Richard Meier- and Renzo Piano-designed High Museum of Art, as well as the Atlanta Ballet, Atlanta Symphony Orchestra, Center for Puppetry Arts, and other arts and entertainment venues. Recently, the Woodruff Arts Center and its campus were expanded. Future additions will include a new Atlanta Symphony Center. The High has collaborated with major art museums to house temporary collections of masterpieces, most notably the Louvre and the Metropolitan Museum of Art. Across the street from the High is Museum of Design Atlanta (MODA), the only museum in the Southeast devoted exclusively to the study and celebration of all things design. Midtown is also the home of the Atlanta campus of Savannah College of Art and Design, which is located in historic buildings throughout the district. Midtown's Piedmont Park is a popular venue for cultural festivals in Atlanta. Every spring, when the native dogwoods are in bloom in Piedmont Park, is the Atlanta Dogwood Festival, an arts and crafts fair. Piedmont Park is also the finish line of the Peachtree Road Race, held annually on Independence Day. As ground-zero for Atlanta arts community, Midtown is home of the annual Atlanta Arts Festival, which brings artists from across the country to Piedmont Park. Piedmont Park is also the home of the Southeast's largest multicultural festival, Festival Peachtree Latino, which celebrates Hispanic-American culture with arts and crafts, family activities, sporting events, a parade, dance demonstrations, ethnic foods, and a live music stage featuring international performers from Mexico, Puerto Rico, Colombia, Venezuela, and the Dominican Republic. Midtown is also the home of Atlanta's major music festival, Music Midtown, which was revived in 2011 after a five-year hiatus. At the corner of 8th Street and Spring Street, near the Midtown MARTA station, Midtown also hosts the Peachtree Music Festival, a one-day, two-stage music festival blending indie rock bands with electronic DJs. In the fall, the Atlanta Pride festival attracts the LGBT local and regional community while the week-long Out on Film gay film festival highlights films by, for, and about the LGBT community. Residents are zoned to schools in the Atlanta Public Schools. In addition, the campuses of Georgia Institute of Technology, John Marshall Law School, and the Atlanta division of the Savannah College of Art and Design are located in Midtown. Midtown Atlanta is served by Atlanta's rail rapid transit system, MARTA, at the North Avenue, Midtown, and Arts Center MARTA Stations. MARTA operates significant bus service in the district, as well. There is also a free shuttle between the Arts Center MARTA Station and Atlantic Station, as well as a free-to-the-public daytime shuttle between the Midtown MARTA station and Georgia Tech called the "Tech Trolley". Ecodistricts are being implemented in leading cities around the world and Midtown has just completed a process to create Atlanta's first ecodistrict. The Midtown Ecodistrict was created in 2012 as a platform for the community to collaborate on initiatives that results in improved environmental and economic performance. The program focuses on measurement on sustainability methods throughout the company. Green operational practices in the areas of energy, water, transportation and waste were implemented in an effort to make Midtown one of the most livable, vibrant and sustainable districts in the country. In 2014, Midtown Alliance (who created the ecodistrict) decided to highlight business and buildings in Midtown that have made a significant commitment to green practices. This district is heavily urbanized (buildings, shops, skyscraper and hotels). Midtown also serves cyclists and pedestrians with 5 miles of bike lanes. The restaurants established in Midtown are recycling and composting at least 95% . 50 recycling cans have been installed. ^ "Midtown Atlanta" (PDF). Midtown Alliance. 2013. ^ "Arts & Attractions". www.midtownatl.com. Retrieved 2018-07-09. ^ a b c Midtown Alliance, Midtown Market Report, 2007 Archived 2007-10-21 at the Wayback Machine. Retrieved June 3, 2009. ^ "Suburbs will not be annexed now: The Rice measure tabled by Council yesterday afternoon", Atlanta Constitution, October 27, 1897. North Atlanta was defined as the area including today's Midtown between Myrtle St. in the Midtown Historic District and Cherry St., now inside the Georgia Tech campus, as far north as 14th St (then called Wilson Ave.); most of what is now the Georgia Tech campus, south of what was then 5th Street; and the area west of Georgia Tech, south of Jefferson St., as far west as Ashby St. (now Lowery Blvd. ), including today's English Avenue neighborhood. ^ "National Park Service: Edward C. Peters House". National Park Service. Retrieved 2010-09-30. ^ a b c Tommy H. Jones, "Margaret Mitchell House: Historical Context"
^ "Expert: Peachtree Poised to Be Next Great Shopping Street". Midtown Alliance. Archived from the original on 2007-05-30. Retrieved 2007-06-26. ^ "Mayor to Retailers: Peachtree Is Open for Business". Midtown Alliance. Archived from the original on 2007-05-30. Retrieved 2007-06-26. ^ "Midtown, "Ultimate Neighborhood Guide", Creative Loafing, retrieved November 7, 2011". Archived from the original on 2012-04-25. Retrieved 2011-11-08. ^ MIDTOWN ATLANTA: Business Archived 2007-10-27 at the Wayback Machine. Retrieved June 3, 2009. ^ Equifax Company Profile. Retrieved September 2, 2014. ^ EarthLink Contact Us. Retrieved July 13, 2009. ^ Invesco, Corporate Headquarters. Retrieved June 3, 2009. ^ Coca-Cola United States. Retrieved July 13, 2009. ^ Locations. Retrieved September 2, 2014. ^ AT&T, BellSouth Deal to Affect Atlanta Office Market. Retrieved July 13, 2009. ^ Sams, Douglas. "Carter's moving HQ to Phipps Tower." Atlanta Business Chronicle. December 14, 2012. Updated on December 17, 2013. Retrieved on May 23, 2013. ^ "Contact Us Archived 2010-01-29 at the Wayback Machine." Arcapita. Retrieved on February 25, 2010. ^ King & Spalding - Offices: Overview Archived 2009-04-15 at the Wayback Machine. Retrieved July 13, 2009. ^ "Contact Us Archived 2009-07-16 at the Wayback Machine." Consulate-General of Canada in AtlantaRetrieved on July 28, 2009. ^ "Netherlands Foreign Investment Agency website Retrieved on August 24, 2009." ^ "Consulate General Atlanta." Federal Department of Foreign Affairs. Retrieved on July 28, 2009. ^ "How to contact TECO in Atlanta Archived 2011-07-16 at the Wayback Machine." Taipei Economic and Cultural Office Atlanta. Retrieved on July 28, 2009. ^ "Welcome to the Consulate General of Israel to the Southeast." Israel Diplomatic Network. Retrieved on July 28, 2009. ^ Greer, Richard. "Unionists protest at Japanese consulate." The Atlanta Journal and Constitution. Friday June 23, 1995. Business p. 3H. ^ "Official MARTA website". Retrieved 2008-10-01. ^ "Tech Trolley". GT Parking & Transportation. Archived from the original on 2007-07-17. Retrieved 2007-08-01.